Many sunglasses and eyeglasses made today have different coatings on them to enhance the viewing and cause less strain on the eye. These anti-reflective coatings, dyes, scratch-proof coatings, etc. are costly and make the maintenance of glasses a prudent choice. 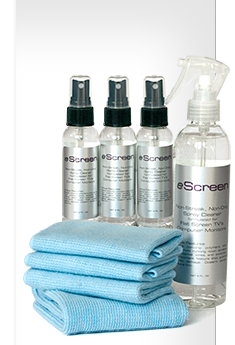 eScreen keeps your glasses clean while protecting the costly integrity of your lens coatings. To clean glasses, remove them from the face and spray the surface with eScreen. Use the eScreen microfiber cloth to wipe the lens clean. eScreen will leave no film and does not contain any harsh or abrasive chemical that can ruin an expensive pair of eyewear. As an added benefit, eScreen sell a microfiber tote that contains 2 ounces of eScreen and a small eScreen microfiber cloth. The draw string tote is large enough to also fit a pair of glasses and can itself be used, in a pinch, as a cleaning cloth.